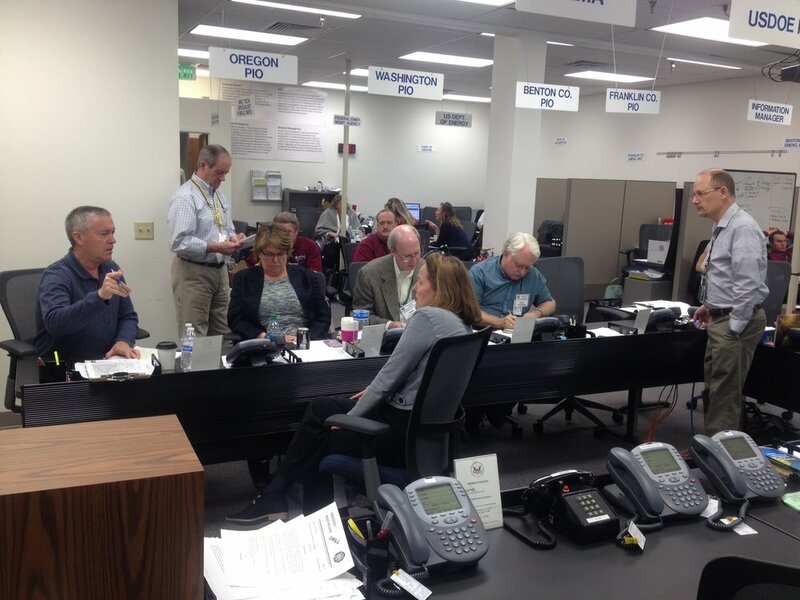 This week, the Oregon Department of Energy participated in a two-day nuclear safety exercise, graded by the Federal Emergency Management Agency. Energy Northwest’s Columbia Generating Station is the Pacific Northwest’s only nuclear power plant. While CGS is located in Washington, it’s just 35 miles north of Oregon’s border. If CGS had an incident or emergency, it could affect Oregonians in the northeast part of our state – so we need to be prepared. The simulated drill involved an incident at the plant which resulted in an airborne release of radiation. The wind was blowing south in the simulation, so radioactive materials would likely deposit in Oregon. While the amount of radiation reaching Oregon would be well below harmful levels for direct exposure, our primary concern would be agricultural products in the area. In the case of a real emergency, we wouldn’t want Oregonians consuming contaminated food, water, or dairy products. Together with our partners, including the State of Washington, Umatilla and Morrow counties, Oregon State University, Oregon Health Authority, and Oregon Department of Agriculture, we practiced tracking possible radiation, releasing information to the public, and testing soil, air, vegetation, and water samples. Our staff were also present in Richland, Washington, at Energy Northwest’s Joint Information Center. We practice these drills each year, and the feedback we’ll receive from FEMA will help us improve operations even more. We hope we never have to put our practice in action – but the drills will ensure we’re ready if we do!